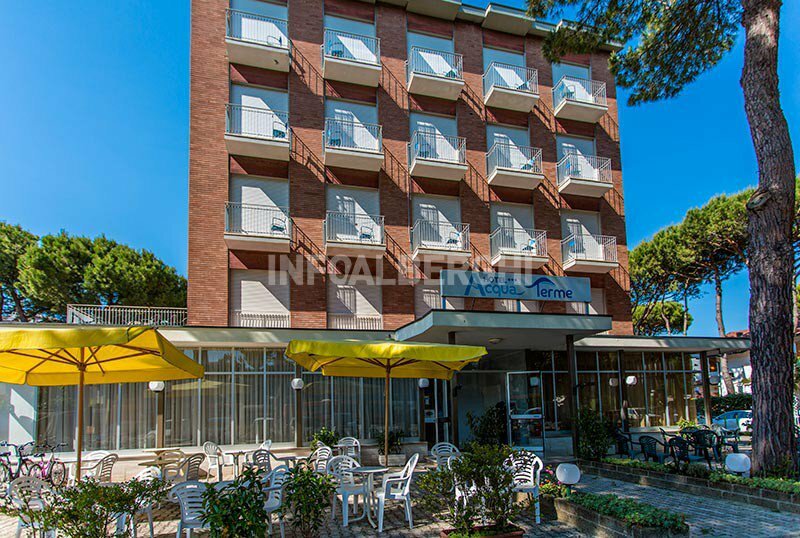 The Hotel Acquaterme B & B is a 3 star hotel in Milano Marittima that has the formula "Just Bed Hotel", a low cost stay that includes self service buffet for breakfast and evening, as well as many agreements with amusement parks and beaches. It is located close to the Cervia Natural Park and about 10 minutes drive from the beach. Accept animals of all sizes. The hotel is located in Milano Marittima in a quiet and little traffic area adjacent to the Natural Park, just a few steps from the thermal baths of Cervia and the CerviAvventura park. You can reach the city center or the beach in less than 10 minutes by car or, alternatively, with a walk of about 20 minutes through the natural paths of the pine grove. The rooms, recently renovated, all have: balcony, air conditioning (active from June), digital terrestrial and satellite TV, safe and bathroom with hairdryer and shower curtain. Cleaning takes place every day. FAMILY: triple and quadruple solutions available for families or groups of friends. Garden, furnished open-air porch with gazebo and tables, large hall and reception area with sofas and TV sat, lift, indoor playground area for children, reading room, Cyber Point corner with PC and printer, free use of bicycles. Adjacent to the hall is the Sala Elisir, where good-morning and good-night buffets are served. AIR CONDITIONING: free in the room from June. CONVENTIONS: beach, amusement parks, discos, gym, swimming pool, spa, waterslide, Inail / Inps conventions, law enforcement agencies. Shuttle service to the center and the beach, organized excursions for a fee. PETS: accept animals of all sizes, without additional costs. BREAKFAST: sweet, buffet from 8 to 12. In hotel: indoor and outdoor playground area with games. Babysitting service and pediatrician available for a fee. In the room: cots for a fee, bed rails.